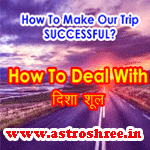 What is disha shool, Reasons of problems in any trip or journey or yatra and remedies, What things to keep in mind before planning any journey or yatra, How to make our trip successful as per astrology, Sneeze and Omen, Sneeze Astrology. Are you facing problem while doing journey, are you not getting the desired result from your business trip, are you not getting the desired response from your journey then this article will help you. If there is a fear always in your mind while going for any trip or journey then this article will help you. Here I am revealing a very important concept of astrology which will definitely help you make money, to enjoy your trip. Here in this article you will come to know about disha shool, impacts of disha shul, why to take care of disha shool, How astrologer will help you to over come from the problems of disha shool. There is a prohibition to travel towards a specific direction in a specific day, tithi etc, this is called disha shool in astrology. It is said to be inauspicious to make journey on a specific day and time So it is good to avoid those inauspicious days to start any journey for important work.We travel for enjoyment and entertainment, we travel to attain any marriage ceremony, we travel to deal any business, we travel to spend our holidays with peace and happiness. But many of us faces problems during journey. Why?, this is very important question and it is also very important to over come from this problem. Avoid travelling on East Direction on following nakshatra and days otherwise loss may occur-Mool, shravan, Jyastha, pratipada nakshatra, Saturday on navmi, Monday, Wednesday. Avoid journey on South Direction on the following days and nakshatra-Poorvabhadrapad, ashwini, dhanishtha and ardra nakshatra, Panchmi and tryodashi tithi, thursday. Avoid journey on North Direction on the following days and nakshatra-Hastha, uttarfaalguni nakshatra, dwitiya and dashmi tithi, wednesday, sunday, tuesday. Avoid journey on West Direction on the following days and nakshatra- Rohini and pushya nakshatra, shashthi tithi, Chaturdashi, tuesday, thursday, sunday. Wednesday and Saturday don't travel towards North- East direction. Thursday and Monday don't start journey towards south-East direction. On Tuesday avoid North-West direction. On Friday and Sunday avoid South-West direction travelling. At the time of dawn don't travel towards East direction. At twilight(godhuli bela) time don't travel towards West direction. In night don't travel towards North direction. In noon don't travel towards South direction. Auspicious Omen are those views which if seen then definitely the journey will go good. In this we will take 2 brahmins, Weeping less funeral, horse, elephant, grains, milk, fruits, curd, flowers, Peacock, Nevla or mongoose, washer-man, jemadar, fair girl, sleeping woman, Bull, Fish, suhagan etc. If these seen while starting any journey then definitely the trip will be successful. Gold smith, buffalo riding, weeping persons, widow, flour, lime, leather, war of buffaloes, naked person, lady with open hairs,etc. are the inauspicious omen. If these scene come before then some problems will come in journey. Sneeze of cow will be the sign of a big problem. Sneeze at back is good. Left hand sneeze is auspicious. Front sneeze will arise conflicts. Right hand sneeze will lead to loss of money. Own sneeze is not good. 2 sneeze at one time will make every thing ok.
Sneeze at the time of taking meal will provide good meal next day.